Now that the Glover Prize has officially opened I can share my work that was selected as a finalist. Deceiving View is an etching on hot pink rayon velvet that shimmers silvery pink from one angle and glows hot pink from another. It is bordered by cream silk satin embroidered and beaded with Tasmanian blue gum blossoms. A picturesque view of the Tasmanian wilderness is subverted and distorted. Iconic Cradle Mountain re-imagined as a snow capped peak more at home in the European Alps. The etching on velvet appears as a shimmery baby pink from one angle only to blow out into lurid neon as you move past the work. This colourshift causes the detail of the land to appear and disappear as your eyes are overwhelmed by a colour more at home in horror film than a needlepoint. Beaded Tasmanian blue gum blossoms frame the work, catching the light and viewers eye at the same time as they pull and distort the fabric underneath. These shifting views reflect the history of Australian landscape art as a tool of colonisation. The transformation of a land labeled and depicted as wilderness to allow and excuse colonization. Port Jackson Press is showing a survey of my recent etchings opening on the 21st of February. Port Jackson Press is a mainstay in the Australian printmaking community. They have exhibited many of the leading print makers in the country. The exhibition will embrace my love of the tones, textures and technicalities of etching. 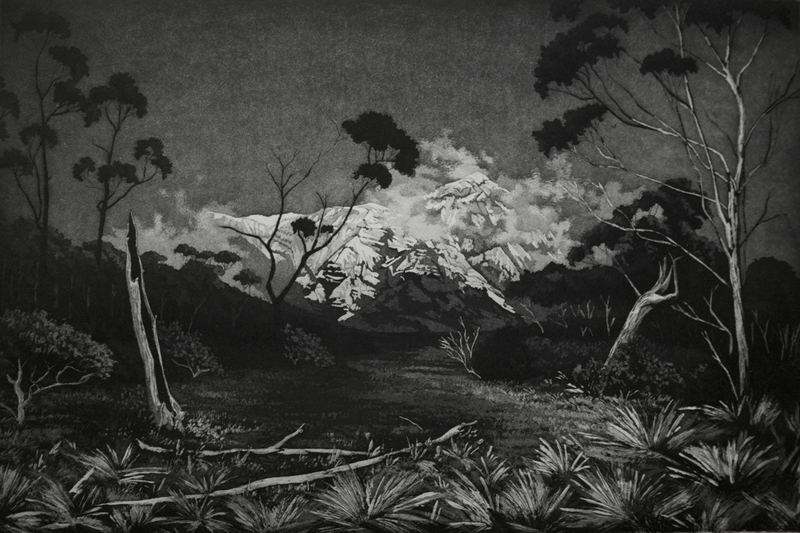 The landscapes are fantastical, pieced together from Australian wilderness spaces and most recently the Himalayas. I hope if you are in Melbourne that you can make the time to stop by. Etching are always more wonderful in real life, where the depth of tones and textures can be seen. For purchase inqurires please contact Laura at the email below. My newest piece ‘Deceptive View’ an etching on velvet with embroidered silk border has been selected as a finalist in the 2019 Glover Prize. The Glover Prize celebrates the legacy of John Glover and the Tasmanian landscape. The prize aims to stimulate conversations about the meaning and possibilities expressed in the words landscape, painting and Tasmania. I will post images of the piece after the opening on the 8th of March. For more info and the list of finalists visit their website here. Four of my etchings including two from my most recent series Distance of Longing are currently on exhibition at Port Jackson Press in their Summer Salon exhibition, December 1st - January 30th 2019. My prints are in great company with new works by their stable of talented artists. You can find the list of my works here. If you are interested in purchasing any of these pieces you will find their gallery manager Laura to be wonderfully helpful. I really love how the etchings they selected show the development of my landscape work over recent years. The earliest piece Suburban Pastoral 3 depicts suburbia as the intersection of constructed and natural space, a frontier. Ghost Gum Woods moves into a true wilderness space with sinuous gums recalling the works of Sydney Long and John Glover. Distance of Longing (allure) and (disquiet) take the Australian wilderness to a sublime place of dreaming and horror. Imposing monumental mountains in the distance invoking fantasy and desire reflecting the subjective and constructed nature of landscape art. My work Luscious Skin has been accepted as a finalist at the FIsher’s Ghost Art Prize at Campbelltown Arts Center. The exhibition runs from the 3rd of November to the 13th of December and will have an amazing array of contemporary Australian art. Next to the Skin is a finalist in the Hahndorf Academy's 2018 Heyson Prize for Landscape. The prize encourages artists to express their deep connection with, or their deep concern for, the Australian landscape and environment. Attachment to place is an ongoing theme that I have explored in my work through the depiction of landscapes using craft techniques. Next to the Skin is seductive and feminine, imagery of Australian wilderness landscapes is shaped to the body, creating a new girly wilderness. Exhibition dates are from the 6th of October to the 9th of December 2018. My work Verdant Skin has been selected as a finalist in the Pro Hart Outback Art Prize at Broken Hill Regional Gallery. The exhibition is open from the 3rd of August to 23rd of September 2018.